In her three traditional color of the South, 6 including Kim Thuy Vovinam martial artists, Bich Phuong, Van Cuong, Binh Dinh Khac Nguyen and Tran The Thuong was devoted to Russian spectators and officials representing agencies Russian diplomats and a large number of Vietnamese living working in Russia 4 unique repertoire of martial arts Vietnam include: Crushing leg attack, sword training Song, Song practicing machetes and Safeguard women. With her level 6 home World Championships on the right, Vovinam techniques as more vivid in her multi-colored shirt features three Southern and heavy drumming of artists Theatre Vietnam dance music accessories Graphics. In preparation for its excellent art program, the person the Minister of Culture, Sports and Tourism Hoang Tuan Anh, Russian Ambassador Andrey G. Kovtun Vietnam has reviewed and processed in Hanoi prior to delegation Street. Minister Hoang Tuan Anh main was Vovinam suggestions to change costumes on stage performing to create authenticity, more normal life and after results are costume changes, Vovinam martial artists have left impression strongly with international audiences at the opening concert of her shirt three Southern tradition and the girls in the bandana was legendary capital of the resistance against the American heroic peoples of Vietnam. Immediately after the show, dozens of viewers who are officials of the diplomatic corps of foreign countries, Russia and Vietnam youth exchanges and has to take souvenir photos with boxers Vovinam Union. Anh Tran Phu Thuan – Vice Chairman of the Vietnamese people in Russia – a businessman who often support for Vietnamese students – excitedly said: “Although the Vietnamese people but this is the first time I’ve seen a show excellent martial arts and so cultural. We hope there will be more programs like this to friends around the world and even the Vietnamese people away from home as we do “. “Not just a martial art performances, through the beauty of Vovinam reminder to patriotic traditions, martial spirit of his father to the young Vietnamese living abroad is to do regular”, Master Nguyen Huu About – Director, Chairman of the Trade Union Sports Ministry of Culture and Tourism – Vietnam delegation members also said. Personally Minister Hoang Tuan Anh and Vice Minister of Culture and Russia gave up giving flowers to congratulate all the members of the delegation attended the opening ceremony. In June 24, the General Directorate of Sports United Bich Thang and General Secretary of the World Vovinam Federation Vo Danh Hai also had a meeting of Federation of Russia led by the chairman Yuri Popov led. At the meeting, the Russian Federation proposed the Vietnam supports Russia movement and report on the development here. 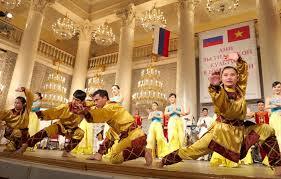 Accordingly, Russia currently has more than 15,000 students to practice and develop fairly strong movement. With a development time of more than 20 years, Russia is a country with many boxers winning world championship especially antagonistic content. As planned, the development cooperation between Vietnam and Russia Vovinam will be the Minister of Culture, Sports and Tourism Hoang Tuan Anh and the Director General of Sport United Bich Thang included in the work program with the Ministry Russian Sports Minister in the afternoon meeting July 26, 2015 hours Moscow. Vovinam martial artists will continue with two important concerts in the cities of Saint – Petersburg and Yaroslavl Art Group and Vietnam.